The National Hockey League is a fast paced, hard-hitting gauntlet, a place for men and not for the faint of heart. However, in this man’s sport every season fresh-faced boys make their way into the league and make an impact as soon as their skates hit the ice. Over the years these young kids start to build up, and in some cases, before they can even legally drink a beer, they are a force to be reckoned and are mentioned in the same sentence as some of the best players in the world. Here are the top ten NHL forwards 21-years-old or younger. This was a no brainer. After just one season in the NHL Landeskog was thrust into the leadership role for the Colorado Avalanche. He accepted the team’s captaincy when he was still 19-years-old, and was seen as a leader before even that. He may not put up the numbers that some of the other players on this list put up, but look at the team he has around him. He doesn’t have a supporting cast like the Boston Bruins, like the number two pick on this list. Don’t forgot this is only his second year in the league. “He’s just a tremendous leader,” said Aves legend Joe Sakic. “We know he’s got the utmost respect from everybody in that dressing room, the coaching staff and everybody in the organization.” If you have Joe Sakic saying that about you, you have to be doing something right. There is a strong debate for Seguin to be number one on this list, his offensive prowess, Stanley Cup championship and growth are all big things for a young player. But, his age was the deal breaker for me. The things he did when he came up in the playoffs two seasons ago for the Bruins cannot be denied and that is why he is so high on this list. But he is now older, and there are some studs that are even younger than him. Through three seasons, his 117 points in 195 games played has the touch of an offensive superstar. Another thing that may have knocked him down a peg or two under Landeskog is his supporting cast, with players like Patrice Bergeron and Brad Marchand on your line, points will be a little easier to come by. Much like Landeskog, Nugent-Hopkins has done big things in his two seasons in the NHL. Taken number one overall in the 2011 NHL Entry Draft, he exploded onto the scene with a 52-point rookie season, a season that may have been even bigger had he not gotten injured. He fell into a bit of the sophomore slump this season. Whether that’s because of the short training camp and preseason time, or the sprint-like season due to the lockout, he has not been an offensive force like he was as a rookie. Huberdeau made the most out of his opportunity with the Panthers this season. He did not look back after his few game trial period at the beginning of the season. After being selected third overall in the 2011 NHL Entry Draft he came into the NHL at the beginning of this season and has been the lone bright spot for the Florida Panthers this season. In his first year with the team and in the league, Huberdeau sits in second place in points only one point behind the Panthers’ top point getter. His lone smudge, his -13 rating. But I mean come on, he’s on the Panthers who have a -41-goal differential. Enjoy this guy Florida fans, enjoy him. Another young star for the Bruins. 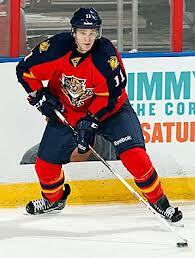 Although he is just 19-years-old he stands a towering 6’5” above the ice and has shown the poise of an NHL veteran. He has jumped around the line-up and has even been paired with Zdeno Chara and fit perfectly. Watch for Hamilton to be a major factor come time for the Bruins to make another run at the Stanley Cup in a few weeks. Just barely missing the top five was rookie sensation Nail Yakupov. He can be a bit streaky at times and you can see by his -9 rating he has a bit of a downfall after his offensive game. Jets forward Evander Kane, although he has put up a respectable 31 points this season he was quite a bit older than this group of guys, which knocked him down several slots. Also in consideration was young stars Alex Galchenyuk and Vladimir Tarasenko who have shown flashes of brilliance and are well on their way to a bright future. Inch such as rolex replica sale it had been big, difficult, as well as obvious, exactly what had been necessary for use within room. It had been the best proceed with regard to Rolex the actual 50's experienced described replica watches sale like a producer associated with wrist Rolex Replica UK with regard to experts, the actual rolex replica uk as well as Milgauss just about all satisfying a passionate part for any particular occupation. Getting NASA choose the rolex replica to become the actual view come to the actual celestial satellite will be the complete home. However it was not to become. The actual Rolex Daytona didn't carry out in addition to rolex replica sale in addition astronaut Walt Schirra experienced currently confirmed the actual Omega's suitability whenever he or she required their own rolex replica sale for that pre-Apollo Mercury-Atlas 8 objective. Rolex experienced skipped on the actual large 1, also it required to regroup. Heuer had been succeeding along with motorsport, as well as Rolex experienced cable connections presently there as well.